Health professions students Sharn Hooper and Nicola Noble have won their respective age groups at the European Cross Duathlon Championships. Two Plymouth University athletes have claimed gold at the European Cross Duathlon Championships. 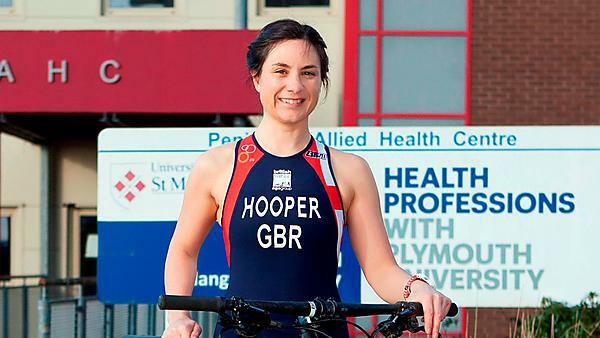 Physiotherapy student Sharn Hooper, 32, won the 30-34 age category for Great Britain at the competition in Transylvania on 23 April, and finished second in the women’s age group races overall. Meanwhile Occupational Therapy student Nicola Noble took gold in the 25-29 age group – more than 13 minutes ahead of her nearest challenger. Organised by the European Triathlon Union (ETU), the cross duathlon championships welcomed elite and age group athletes from all over the continent, and both women had to excel in qualifying events to earn their GB vests. Incorporating an 8.75km run followed by a 28km bike ride and a 3.25km run, all off road, Sharn managed to complete the course in two hours and 47 minutes, while Nicola finished in two hours 54 minutes. “I’m so pleased to have won my age group, and it’s at times like these that you know your training has paid off. I won silver in my age group at the ETU European Sprint Duathlon Championships in earlier this month, missing out on gold by 20 seconds. So winning gold this time made up for the disappointment of my last race." Sharn’s next challenge comes on 23 June at the ETU Cross Triathlon Championships in Switzerland. Nicola's next race is the Duathlon World Championships in Spain on 5 June.